The environmental and economic crises make it abundantly clear that we need an alternative to business as usual. Here are two approaches to developing a more sustainable economy. The first explores the shortcomings of the free market and the second leverages the strengths of capitalism. Current economic approaches have failed to reverse environmental degradation. There are many reasons why we have thus far failed to address climate change. In addition to corporate influence and corruption, elements of capitalism have interfered with the creation of a sustainable economy. 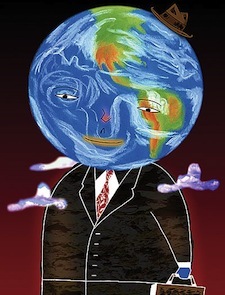 Some believe that sustainable capitalism is an oxymoron. Radical thinker David Korten has argued for an entirely new economic structure. Even though he has been criticized for some of his extreme ideas, Korten nonetheless provides some interesting points worthy of consideration. Korten is the author of several books including the international best seller When Corporations Rule the World. He is a founding board member of the Business Alliance for Local Living Economies and a member of the Club of Rome. He holds MBA and PhD degrees from the Stanford University Graduate School of Business and he served on the faculty of the Harvard Business School. Korten is an advocate of something known as ecological economics. He argues that this new economic order must reach far beyond the understanding of conventional economics and focus on people and nature. “Ecological Economics may be our best hope for producing the tools and advancing the advocacy needed to create an economic system with some prospect of sustaining humans as a viable species,” he said. The confusion of ends and means is reflected in the convention of treating people and nature as externalities, or to put it another way, a means for making money for people who have money. The wrong measure of value means that money rather than life is the basic measure of value. In this fallacy, money acquires more value than the physical substrate sustaining life. The wrong unit of analysis refers to the fact that we have build economics around the firm rather than the household. This leads to measuring economic performance by financial returns rather than the collective health and happiness of people. Improperly defined single criteria function for policy adjustments rather than a set of indicators. The point is that we are measuring economic performance based on costs, not on benefits. Ecological economics is concerned with the organization and management of the human relationship to the biosphere. A first step is to recognize that humans are not entities separate from the biosphere, we are integral to it. We have a living relationship to the biosphere that cannot be reduced to mere financial transactions or calculations. Our economy will not be sustainable as long as it remains disconnected from the biophysical reality. Korten believes that life, not money, must be the primary metric. Real wealth involves things like land, labor, technology, peace and health, while money has no intrinsic value. The biosphere is the foundation of life and as such, it is sacred and beyond any price. Maintaining its healthy function is a sacred and non-negotiable responsibility, not only to future generations, but also to creation itself. The system acknowledges the social core at the heart of the human experience. It seeks to reverse our isolation from nature and counteract the tendency to dominate and expropriate. This economic system works in harmony with the Earth’s biosphere, which is an evolving, dynamic, self-organizing adaptive process. The Earth makes sustainable use of nutrients, energy, and water in support of life. And all resources are continuously repurposed locally and recycled with zero waste. In ecological economics, local ecosystems trade their surplus with their neighbors in return for that which they cannot reasonably produce for themselves. In this system, the locus of economic power is moved from global financial markets to local communities. Values are changed from making money for the rich to creating community wealth for everyone. Korten suggests that we decentralize and democratize the money system so that the power to create and allocate money resides in a system of community banks and credit unions. These institutions are accountable to local people and devoted to serving local financial needs. He further believes that we need to restructure global rules and institutions to limit the concentration of corporate power. He also insists that we should hold corporations responsible, support balanced trade, and promote national ownership. Under this system, the proper function of money is to facilitate the sustainable and equitable utilization of resources to fulfill the needs of people, communities, and nature. He wants to restructure the Federal Reserve to function as a federal agency subject to strict standards of transparency and public scrutiny like audits by the General Accounting Office, and Congressional oversight. Its sole responsibility would be to manage the money supply. As part of the system, all new money created by the Federal Reserve goes to a Federal Recovery and Reconstruction Bank, which would use these funds to finance critically needed green public infrastructure projects as designated by Congress. Despite some powerfully compelling points, Korten’s utopia also harbors some fallacies. Life as the primary metric is not quantifiable and the resource allocation capacity of centralized institutions is inferior to the capabilities of the free market. Non-monetary approaches to social change have been around for decades, but they have not produced results whereas the right incentives are capable of inducing change on a grand scale. An economic model premised on incentives is more compatible with the fundamental reality of human nature. An incentive based system fosters creative responses to our economic and environmental crises, it is also more efficient than altruism or any other motivator of social change. One of capitalism’s most serious flaws concerns the fact that market incentives often cause people and the environment to benefit in inverse proportion to their need. We need to refine the capitalist system so that it benefits the environment and provides for the basic needs of all its inhabitants. Putting a price on carbon could further help to bridge the disconnection between our economic system and the biophysical reality. Ultimately, capitalism is unsustainable as long as it serves only large corporations and the wealthiest people. This is not a new idea. Almost half a century ago, David Rockefeller, the president of Chase Manhattan Bank, said, “The old concept that the owner of a business had a right to use his property as a he pleased to maximize profits has evolved into the belief that ownership carries certain binding social obligations.” More recently, Microsoft’s Bill Gates has joined the ranks of a growing number of present and former corporate leaders who share this view. For the past 20 years, Microsoft has donated more than $3 billion in cash and software and perhaps most importantly, they have shown people how to use technology to create solutions. In this new wave of social activism, consumers reward sustainable companies by buying their products and by boycotting egregious offenders. To help us to recognize sustainable enterprises, we need to continue to refine measurement tools so that recognition can bring market-based rewards to sustainable businesses. Gates also emphasizes the importance of studying the needs and limits of each market. Unlike Korten’s model, there are numerous functional examples of creative capitalism in the world today (e.g. tiered pricing, microfinance, cap and trade). The potential ways in which creative capitalism can serve socially responsible causes are limitless. Sustainable capitalism may be our last best hope. The fact remains that no economic system is more efficient or more effective than the free market. Despite justifiable suspicions about capitalism, it is a mechanism of exchange that is capable of being a force for good. With the right approach, we can leverage the power of market forces to reduce our environmental impact. Underlying this philosophy is the scriptural belief that there will always be the poor among us and thus inequality. Not a eutopia and a far cry from the human potential. Innovation and creation suggest a passion for the common good of all humanity. Money, profitability, are concepts which fail to bring the rapid innovation desired serving both humanity and the environment. Money is the single most influential governing factor in the lives of human beings. The potential for humanity is in self-governance which precludes money, barter, or any other medium of exchange. This is the struggle we currently see world wide for humanity, self-governance. The proficiency of capitalism, the law, and what we currently refer to as governments is to teach, facilitate, and role model the art of self-governance and accomplish the potential in humanity that is harmony without compromise. I am a licensed engineer. I did my own research (unfunded) using web-available data from government agencies. Discover the influence that measured added atmospheric carbon dioxide had on measured average global temperatures during the 20th century and since at http://climaterealists.com/index.php?tid=145&linkbox=true. See especially the pdfs made public 4/10/10, 3/10/11 and 9/24/11).